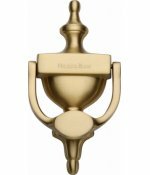 Heritage brass urn door knocker, available in 6 inch 152mm, with 90mm fixing bolt centres, or 8 inch 195mm, with 115mm fixing bolt centres. 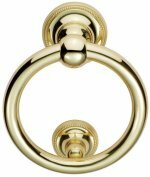 Solid brass ring door knocker, supplied with fixings. Size 134mm diameter, fixing plate 79mm, strike plate 35mm, with 110mm fixing bolt centres, available in Polished Brass, Polished Chrome & Satin Chrome. 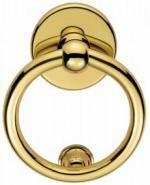 Solid brass ring door knocker, supplied with fixings. Size inner diameter 77mm, outer diameter 107mm. 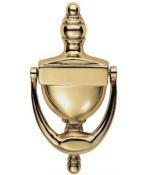 Available in Polished Brass, Polished Chrome, Satin Chrome, Antique Brass, Satin Brass, Satin Nickel & Polished Nickel. 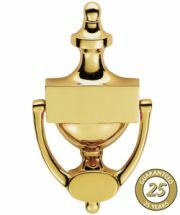 Solid brass column Doctor door knocker, supplied with fixings. Size 192mm 43mm, base diameter 55mm. 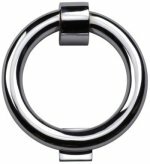 Available in Polished Brass, Polished Chrome, Satin Chrome, Antique Brass, Satin Nickel & Polished Nickel. 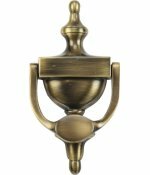 Solid brass Victorian urn door knocker, supplied with fixings. 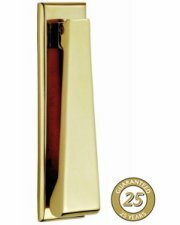 Available in 152mm (6inch), with 98mm fixing centres & 202mm(8inch), with 126mm fixing bolt centres in Polished Brass, Polished Chrome & Satin Chrome. 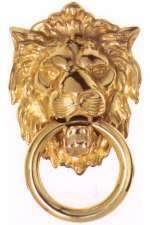 Solid brass Georgian urn door knocker, supplied with fixings. Available in 8inch (202mm) with 123mm fixing bolt centres. 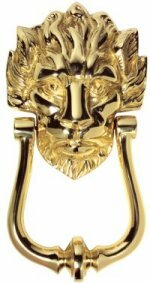 PVD brass Victorian door knocker for a lasting finish, size 8inch 202mm, bolt fixing centres 126mm. Solid brass front door knocker on backplate. Size 135mm x 39mm, fixing bolt centres 95mm. 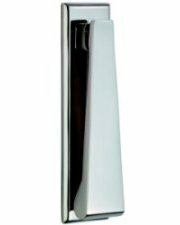 Available in Polished Brass, Polished Chrome, Satin Chrome. 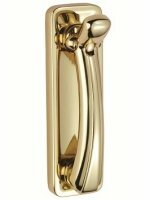 Solid brass PVD Doctor door knocker. Overall size 186mm x 34mm, projection 69mm, fixing bolt centres 120mm. 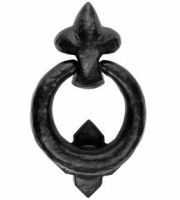 Ludlow Foundries black iron antique finish door knocker, supplied with fixings. Size 95mm outer diameter. 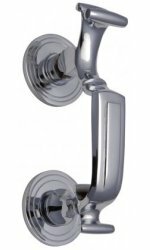 Investment cast 316 grade stainless steel door knocker. Size 166mm x 40mm, fixing centres 128.5mm. 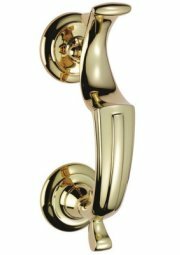 PVD brass slimline door knocker. Backplate size 166mm x 40mm, fixing bolt centres 128.5mm. 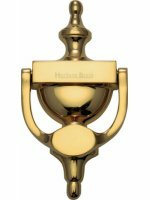 Satin brass urn door knocker, available in 6 inch 152mm or 8 inch 195mm sizes. 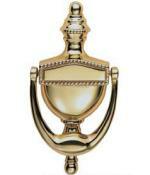 Antique brass urn door knocker, available in 6 inch 152mm or 8 inch 195mm sizes. 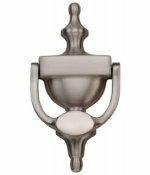 Satin Nickel urn door knocker, available in 6 inch 152mm or 8 inch 195mm sizes. 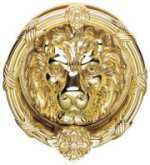 Solid brass Downing Street (No.10), old english style, Lion door knocker, supplied with fixings. Size 9 inch 230mm x 120mm, with 126mm fixing bolt centres. 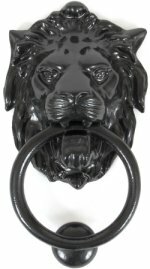 Solid brass Georgian lion head door knocker. Size 9 inch 230mm x 140mm, with 142mm fixing bolt centres. Beaded door knocker in solid brass. 134mm diameter ring, fixing plate 60mm, strike plate 45mm diameter. 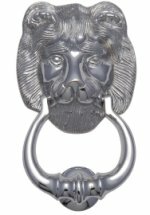 Solid brass large lion head door knocker (castle knocker), supplied with fixings. Size: backplate 202mm x 224mm, knocker 226mm x 242mm.